The Grandeco Geometric Glitter Wallpaper in Teal and Mocha is a fabulous design ready to add a retro touch to any room. First of all, this delightful wallpaper has a striking geometric design which will make a welcome addition to any home. Secondly, the wallpaper is blown vinyl giving a beautiful textured finish which helps to bring the retro print to life. With a modern take on colours, this teal and mocha wallpaper has a contemporary twist whilst glitter accents complete the look. 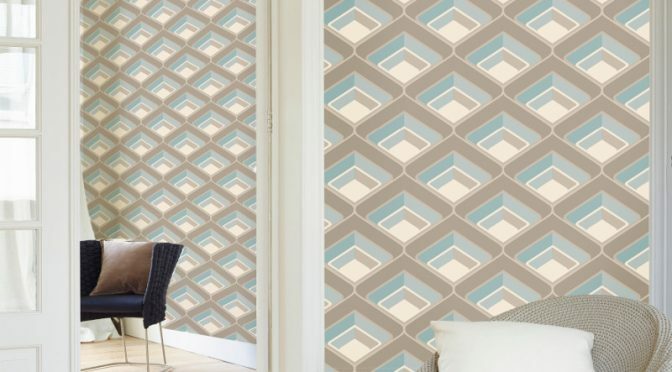 Furthermore, the Grandeco Geometric Glitter Wallpaper in Teal and Mocha is perfect for creating a feature wall. Finally, it is washable for a long lasting finish.